Discover beautiful, tranquil waters and out of this world on-shore experiences in the Southern Peloponnese when chartering a luxury yacht in Greece. Read the full Greece charter guide here. Just off the southern Peloponnese as you approach the island of Spetses you’ll see kaikis or caiques being built. These are small wooden trading vessels which are painted in bright colours and rigged for sailing. Used for fishing and trawling the skill in building these boats has been handed down from father to son through many generations. The Greeks have watched their harbours change over the years and today superyachts anchor in the bay of Spetses. Large superyachts are more familiar around Mykonos and Santorini in the Aegean Sea, two of the Cyclades Islands. 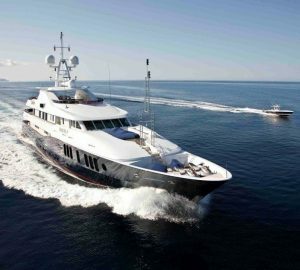 However, superyachts are now anchoring in the calmer waters of the south west which are being dubbed the new Greek Riviera. This includes Porto Heli, Hydra and Spetses. The Cyclades and the central Aegean often have strong winds and a dryness which is quite out of character in this region. Spetses on the other hand is green with mild temperatures, lemon and olive trees, as well as interesting architecture. This area has a few advantages over the yachting playground of Greece. Meltemi winds which can be quite dangerous to sailors as they suddenly appear in good weather without any warning, often create unpredictable weather. The Greek Riviera on the other hand has weather that’s fresh with steady, mild winds that don’t make anchoring dangerous. 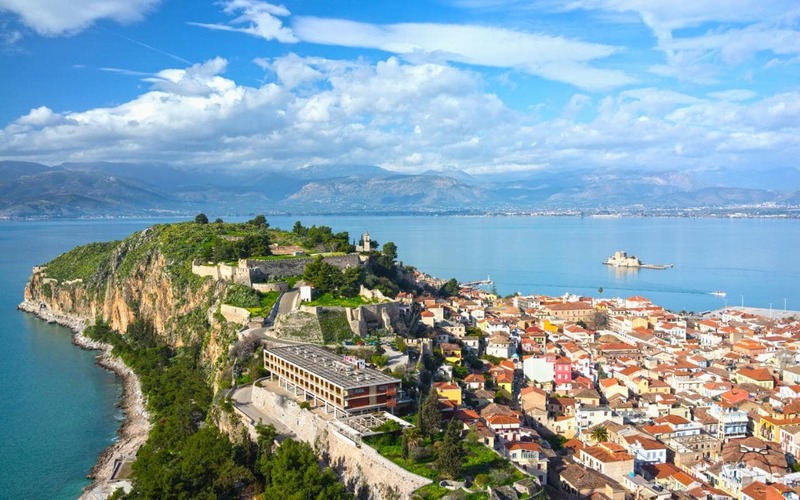 Greece is definitely a fantastic destination to sail to especially with wealthy Athenians and Greek royals. From the capital to Porto Heli it takes about one and a half hours or 40 minutes using a helicopter. During recent years the Poseidonion Hotel on the waterfront of Spetses has undergone a revamp. This is a one-hundred-year-old hotel. The luxurious Aman Resort, Amanzoe in Kranidi on the mainland has also been recently built as well as the Nikki Beach Resort in Port Heli. More and more superyachts are arriving here every year. For this reason, plans are being drawn up to build a Chedi Hotel with a golf course in the hills of Kilada. There’s also going to be a 170-berth marina created to take even more yachts. The result of all this building work is an elegant masterpiece situated among neo classical villas and pine trees. Primarily for foreign jet-setters and affluent Greeks, the area beckons those owners of superyachts who love beauty and all it affords. The Amanzoe Hotel was opened in 2012 and it is this hotel which has put the region on the map for yacht owners. It’s in an idyllic location with the most spectacular views over the valley to the mountains and the sea on the other side. The hotel has pavilions and guest villas with walled gardens. Hollywood actors, billionaires and many sports stars have been spotted at the Amanzoe which is noted for its privacy, luxury and peaceful surroundings. There’s a helipad here and a fabulous spa that offers Watsu water therapy treatments. Views from the Pilates and yoga glass-sided studio are absolutely breath-taking. On Amanzoe’s private beach the Wally One power boat is moored. 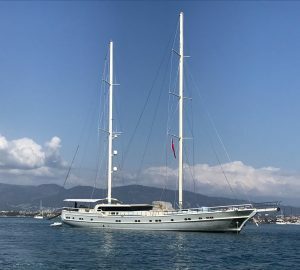 This vessel can be used by guests who wish to explore the nearby islands, bays and coves along the peninsula. Day trips include sailing to Hydra, well known for its lovely markets, galleries and rustic restaurants. Dokos, a small island of the Argo-Saronic Gulf, close to Hydra, is famous for an ancient shipwreck which was discovered in 2200-2700 BC. The Poseidonion Grand Hotel was built in 1914 in a Cote d’Azur style. This hotel was virtually in ruins until Antonis Vordonis discovered the building and refurbished it over five years. The restoration took many years to finish, however it is now in a class of its own. The hotel is a great base from which to explore the car-free island. In front of the hotel the pier can accommodate yachts of 50m, although a 120m superyacht has been known to anchor there. There’s a statue of Bouboulina in the new harbour. She was a member of the Greek revolution against the Ottoman Empire and became a heroine. Armata, a festival held in September, commemorates a Turkish flagship, a model of the ship is burnt in the harbour. It’s a great spectacle to see. Porto Heli resort is said to rival Monaco. It’s where former King Constantine II and Queen Anne-Marie have a boat and house. The world-famous actors, Antonio Banderas and Sean Connery are believed to own villas here. With amazing mooring and facilities for huge superyachts, Roman Abramovich, Steve Jobs and the Barclay family have all been spotted in Porto Heli too. The resort of Porto Heli has a new resort and spa, Nikki Beach. This offers a young, lively atmosphere with champagne parties and a DJ playing dance music all day as well as in the evening. The building has 66 rooms and suites with mirrored walls and magnificent sea views. A gym with personal trainers as well as a spa are available to use while Café Nikki provides gourmet meals comprising sushi on dragon-shaped plates and amazing salads. The Pearl Rooftop Lounge is a fantastic place to socialise while enjoying a cocktail or two. From a small fishing village with boats in the dock to superyachts being moored, Porto Heli is definitely the place to visit. 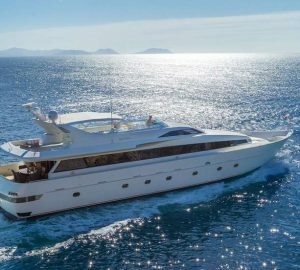 Feel quite at home in beautiful surroundings, on board a luxurious charter superyacht and soak up the wonderful atmosphere. The port of Ermioni is approximately ten miles by road from Port Heli. Work is going to start soon on a new marina here which will accommodate 127 yachts of up to 65m in length. This work should take about eighteen months to finish and will set a new benchmark for Greek superyacht marinas. The marina is going to have vibrant bars, amazing restaurants, shops, a swimming pool along with a unique chandlery.